Gymnodoris ceylonica were everywhere! Pearly white nudibranchs with orange spots were crawling along the ocean floor. What was going on? The dive site was Tambo’o Fish House. It is a favorite muck diving site in Gorontalo. No nudibranchs were seen the previous day. Then suddenly one day in November, there were dozens and dozens of Gymnodoris ceylonica nudibranchs. Most were about five centimeters in length. Upon closer inspection, those Gymnodoris ceylonica nudibranchs were mating. Then they were laying eggs on various kinds of algae. A few were laying eggs on the sand. Miguel’s Diving staff had never seen this happen. So, we came back on the two following days to film this rare event. By the third day, all the nudibranchs had disappeared. Only their eggs were left. Watch this amazing video, shot by Mr Yunis Amu of Miguel’s Diving. Notice the translucent body of this nudibranch. 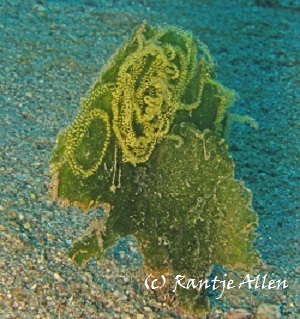 Sometimes, the yellow eggs still inside the nudibranch are visible from the outside! The common name for Gymnodoris ceylonica is Ceylonese nudibranch. 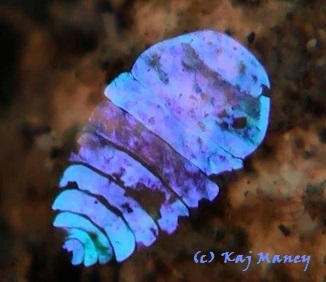 It was first discovered in 1858 off the coast of Sri Lanka. That island was a British Crown colony at the time marine researchers were working there. The British called their colony Ceylon, hence the name of this nudibranch. This lovely nudibranch prefers open grass beds. Plenty of algae live in that marine environment. 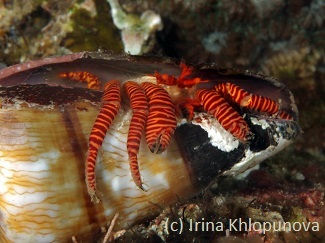 Ceylonese nudibranchs are not vegetarian, however. They are carnivores. 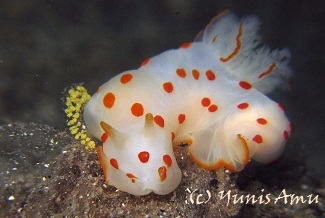 They eat other nudibranchs. Pictures of one eating a sea hare are available here. Mr. Bill Rudman of Sea Slug Forum has several observations about the eggs of Gymnodoris ceylonica. Most noticeably, the eggs are not in the classic, smooth ribbon like other nudibranchs. These egg masses are almost messy in comparison. Missing are the pretty spirals that divers expect to see. Johnson & Boucher studied the eggs of this nudibranch in 1983. They discovered that the eggs are arranged in clusters of 20 to 40 eggs. Each yellow dot visible in the video and photo is actually a cluster of eggs. Divers never know what to expect here because of the incredible variety of marine life. 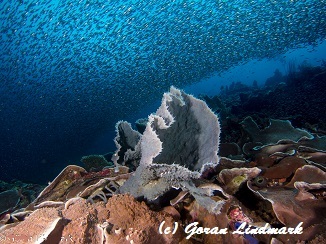 For your chance to watch Gorontalo marine life, please book your dive trip with us. Bokeh can help underwater photographers achieve dramatic effects. The term bokeh comes from the Japanese word meaning blur. In ordinary photographs both object and background are in focus. The bokeh effect relies on blurred background. Only the object is in sharp focus. Beginning underwater photographers are happy when everything in a photo is in focus. They are happier still if the color is good. Bokeh is an advanced technique. It concentrates on having only the foreground object in focus. The background is deliberately blurred. With this technique a simple id shot becomes dramatic. 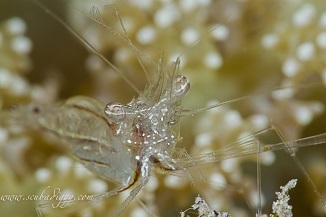 Many shrimps, crabs and fish rely on camouflage. Others have transparent bodies. Both of these help blend the creature into its environment. Being unseen means safety. 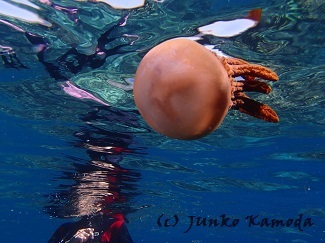 However, the underwater photographer wishes to shoot those creatures in ways that they can be seen. Their unseen beauty is better recognized using the bokeh technique. Otherwise, the creature still remains obscured by its environment. Typically, only the eye or the face of a marine creature is in focus. The rest of its body remains out of focus. Its living space, whether crinoid or coral, is also blurred. Three among Miguel’s Diving staff have placed in international underwater photo competitions. That means we know how to help guests get better photos. Underwater bokeh photos for this blog are courtesy of Mr. Digant Desai of Bombay, a repeat guest of Miguel’s Diving. All photos were shot in Gorontalo. The bokeh effect relies on a sharp foreground object and blurred background. Here are several tips. Manual settings must be used, not automatic ones. First, select the smallest F-number available. This will decrease the depth of field and isolate focus on only a small part of the frame. Take a shot to check results. Second, use the zoom feature on your camera. This will further isolate the focus on the desired object. Take another shot and adjust. Third, move as close as possible to the object. When shooting underwater, this can be challenging. Some marine creatures think their camouflage is working. They will not move. Others can become afraid and flee when a photographer gets too close. That is why the zoom should be used before getting closer. Moving closer also requires patience. Once marine life discovers that you mean no harm, approach is easier. Fourth, certain macro lenses can achieve better bokeh effects. This will depend on the make and model of the camera used. There is one caution to note. Simply using a computer program to make a close crop of an object will not achieve the bokeh effect. The background must be blurred at the time the photo is taken. 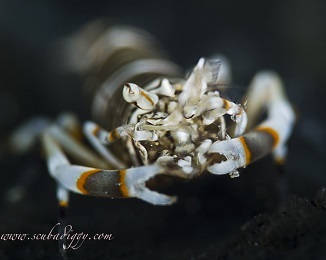 For your chance to shoot pictures using the bokeh effect in Gorontalo, please book your dive trip with us. Indonesia visa free travel regulation was just expanded to citizens of 45 countries. On 9 June 2015 Indonesian President Joko Widodo signed a new law. Presidential Directive No. 69/2015 expands the list of countries whose citizens can enter Indonesia visa free. This marks an effort to boost tourism from those countries. It also aims an improving relations. Citizens of those countries can receive an Indonesia visa for free upon arrival. The new Indonesia visa provides a 30 day stay. The new free visa cannot be extended. This visa is for visit purposes only and not for study or business. The free Indonesia visa is only available at certain ports of entry. These are Soekarno Hatta Airport (Jakarta), Ngurah Rai Airport (Bali), Kuala Namu Airport (Medan), Juanda Airport (Surabaya), Hang Nadim Airport (Batam), Seaport Sri Bintan, Seaports Sekupang, Batam Center Seaports and Seaport of Tanjung Uban (Riau). Austria, Bahrain, Belgium, Brunei, Cambodia, Canada, Chile, China, Czech Republic, Denmark, Ecuador, Finland, France, Germany, Hong Kong, Hungary, Italy, Japan, Kuwait, Laos, Macau, Malaysia, Mexico, Morocco, Myanmar, the Netherlands, New Zealand, Norway, Oman, Peru, Philippines, Poland, Qatar, Russia, Singapore, South Africa, South Korea, Spain, Sweden, Switzerland, Thailand, United Arab Emirates, United Kingdom, United States, and Vietnam. This is great news for divers from those countries. 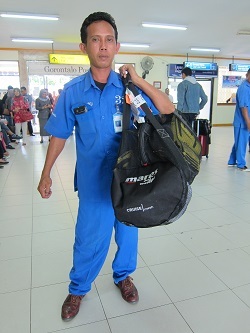 Divers from other countries or those entering Indonesia at a different port will need to purchase an arrival visa. To arrange your dive trip to Gorontalo, please book your dive trip with us. 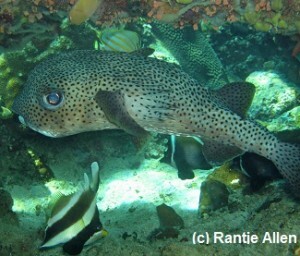 Porcupine fish add to the diversity of marine life in Gorontalo. About twenty species of this unusual fish are found worldwide. 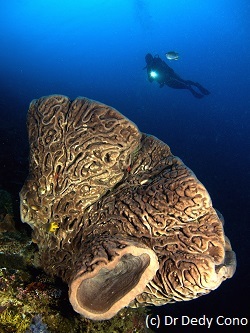 Divers are most likely to encounter three of them in Gorontalo. Porcupinefishes are similar to puffers. 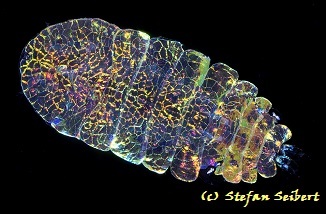 They have distinctive body spines. When threatened, they will ingest water. This dramatically increases their body size and causes their spines to protrude. It is consider bad manners for divers to provoke this defensive behavior. The fish is terrified that it will be eaten. The most common porcupine fish found in Gorontalo is the Black-blotched porcupine fish (Diodon liturosus). It is found in tropical waters of the Indo-Pacific region. It is usually about 45 cm in length. Like other porcupinefishes, it eats sea urchins, gastropods and crustaceans. If divers see more than one, it is mating season. Usually, porcupinefishes are solitary. They are also nocturnal. During the day, they prefer caves and sheltered crevasses. Similar to the Black-blotched porcupine fish is the Long-spined porcupine fish. The only visible difference is that it lacks dark spots on its fins. 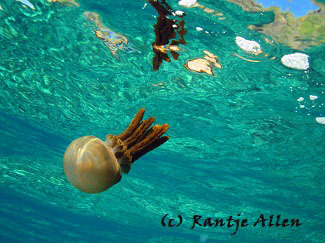 It is found in warm tropical waters worldwide. Its official name is Diodon holocanthus. The Spot-fin is the largest porcupine fish found in Gorontalo. Its scientific name is Diodon hystrix. It grows up to 91 cm and is covered with black spots. It is found worldwide. Like other porcupinefishes, certain of its glands contain tetrodotoxin. This is a powerful neurotoxin. This small type of porcupine fish grows to only 30 cm. Its official name is Cyclichthys orbicularis. Unlike the others, it is found on sandy or mud bottoms. Divers will see it while muck diving. It prefers hiding in sponges during the day. 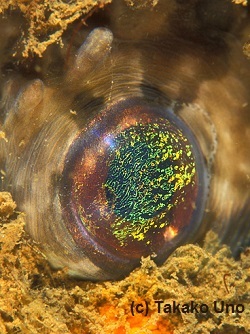 The iridescent eye of this fish graces the back cover of the book Gorontalo: Hidden Paradise. Diving in Gorontalo is exciting because of the incredible variety of marine life. To glimpse one of Gorontalo’s porcupinefishes, please book your dive trip with us. 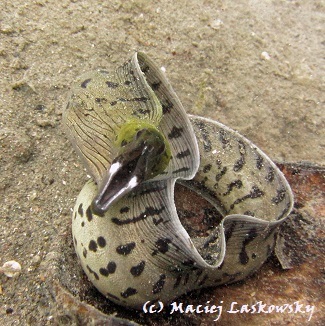 Canthigaster bennetti flows in schools along Gorontalo reefs, forming a magic carpet. 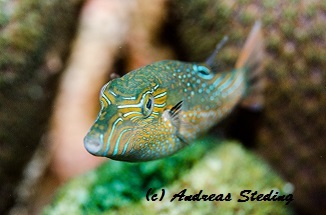 The peak for gathering schools of Canthigaster bennetti lasts only a few days. Then the fish start rummaging in patches of coral rubble. Presumably, they are laying and fertilizing eggs. At this time, individual tobies can be found floundering in mid water. They are clearly malnourished and dying. A closer look reveals that their tails and pectoral fins are severely torn. Presumably, they have been fighting with each other. Within another day or so, thousands and thousands of dead tobies litter the reef. Canthigaster bennetti is a small puffer fish. When threatened, a Bennett’s toby can ingest water and puff itself to twice its normal size. As with other puffer fishes, certain tissues of Canthigaster bennetti contain poisons. Perhaps that is why other fish do not feed on the dead and dying Bennett’s tobies. Water motion eventually carries the dead tobies below diving limits. The mass spawning and dying of Canthigaster bennetti has been scientifically reported. The study comes from Una-una, a volcanic island in Tomini Bay. 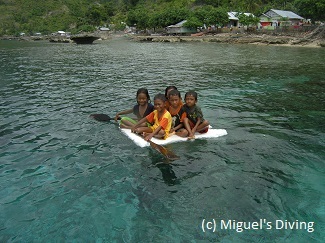 Gorontalo reports of the magic carpet phenomena occur on the north shores of Tomini Bay where Miguel’s Diving operates. Canthigaster bennetti usually occur in pairs or singly. 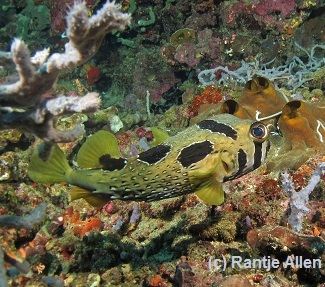 Its cone-shaped nose earns it an alternate name, Bennett’s Sharpnose Puffer. It mainly feeds on filamentous green algae. 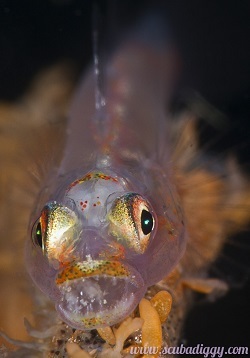 Sometimes, it will eat coralline red algae and benthic invertebrates like tiny shrimps. This harder diet helps break down their ever-growing teeth. 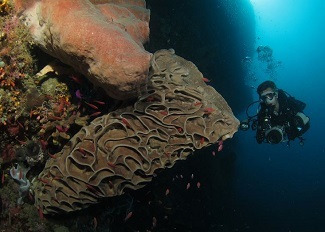 This magic carpet is only one aspect that makes diving in Gorontalo so exciting. For your chance to experience the beauty of Gorontalo, please book your dive trip with us. Simpang Siur adalah salah satu dari beberapa tempat penyelaman yang terdapat di Cagar Alam Desa Olele di Gorontalo. Salah satu ciri khasnya adalah terumbu karang yang masih perawan justru di depan kampung. Tahukah anda mengapa dinamakan Simpang Siur? Karena pada saat kita melakukan penyelaman di situ, terkadang kita harus ikut arus dan terkadang harus menantang arus. Setiap penyelam yang melakukan penyelaman di situ dikenakan biaya, yaitu Rp. 10.000 per penyelam karena Simpang Siur terdapat di dalam kawasan konservasi Desa Olele. Bicara tentang Simpang Siur, itu adalah salah satu tempat penyelaman yang para pengunjung sukai, karena bila pengunjung melakukan penyelaman di situ, pengunjung disuguhkan dengan berbagai macam biota laut dan terumbu karang yang sangat-sangat padat, seperti karang meja, terumbu karang keras dan lunak di antara lainnya. Melakukan penyelaman di Simpang Siur, pengunjung bisa melihat keunikan biota laut yang ada di Gorontalo, yaitu Salvador Dali sponge yg hanya terdapat di Gorontalo. Di Kepulauan Togean pun yang hanya satu lautan dalam Teluk Tomini tidak mempunyai Salvador Dali sponge. Tahukah anda mengapa dinamakan Salvador Dali? Salvador Dali adalah sponge yang permukaannya seperti terukir dan bentuk ukirannya, seperti lukisan seorang seniman yang berasal dari Spanyol, namannya Salvador Dali. Di Simpang Siur, ada Salvador berbentuk bunga dan sangat bagus untuk para pecinta foto bawah laut atau underwater photographer. Ada juga karang kipas yang sangat besar dan tidak mungkin ada pygmy seahorse di situ karena sea fannya terlalu besar. Di Simpang Siur juga bila kita beruntung, terkadang pengunjung bisa melihat hiu paus atau whale shark, black manta, lumba-lumba dan tuna, tapi tidak bisa dijamin. Ada juga biota laut yang lainnya, seperti nudibranch, kepiting-kepiting seperti orangutan crab, soft coral crab. Juga ada udang-udang, seperti Coleman coral shrimp, Sarasvati shrimp dan itu bisa dijamin ditemukan di temapt penyelaman ini. Di Simpang Siur juga adalah favorit para pecinta snorkeling dan katamaran atau perahu kaca pada saat akhir pekan banyak turis lokal dan mancanegara yang datang ke Desa Olele hanya untuk menikmati keindahan taman laut Desa Olele yang salah satunya lokasinya di Simpang Siur. Rata-rata para pecinta snorkeling senang bila melakukan snorkeling di Simpang Siur. Mereka juga bisa memberi makanan pada ikan-ikan, seperti biscuit, roti-roti supaya ikan–ikan di situ berkumpul. Penduduk Desa Olele kira-kira 80% adalah nelayan laut dalam. Mereka memancing ikan laut dalam seperti tuna, cakalang, cumi dan ikan kembung. Mereka tidak memancing di pinggiran karang sehingga mereka tidak merusak terumbu karang. Oleh karena itu, karang-karang di Desa Olele masih padat dan sehat termasuk di Simpang Siur. Datanglah ke Gorontalo dan menyelam di Simpang Siur. Tolong mengurus bookingan langsung dengan Miguel’s Diving.